3D scans instead of dental imprints, setup models from the 3D printer instead of plaster models, positioning of brackets on the monitor, digital planning of lingual retainers – digital orthodontics offers a wide range of options aimed at faster, more efficient processes in your practice. To make the best of these options, we need a process in which the various applications are linked and integrated into a comprehensive digital workflow. 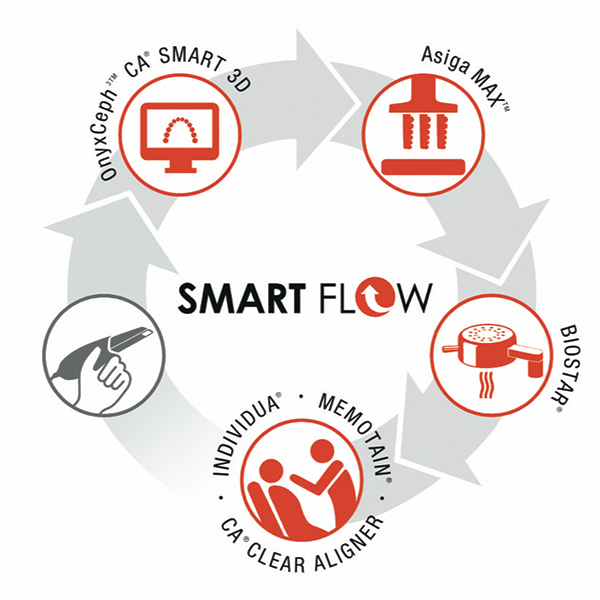 With SMART FLOW, SCHEU-DENTAL and CA DIGITAL are currently the only companies on the market that offer a holistic solution to meet these demands. Practices and labs can determine the step-by-step transition to digital orthodontics at their own pace. All products are available as individual or combined solutions. For the first time in the digital orthodontics industry, a complete range of products is now available from a single source – from 3D setup and 3D printing to treatment of patients with modern digital orthodontic treatment solutions. For every step in the digital workflow after scanning, SCHEU-DENTAL and CA DIGITAL offer tailored solutions to meet the requirements of doctors and patients. The result is an complete process chain that is optimised for orthodontic practices and laboratories. Our product portfolio including digital products and services covers all treatment categories. Furthermore, the OnyxCeph3TM CA SMART 3D software also offers the possibility of planning and organising all the relevant steps within an open system. This ensures maximum precision – from the planning stage to the successful completion of treatment. IS THERE AN INTERFACE TO MY PATIENT MANAGEMENT SOFTWARE? In Germany, a general, standardised VDDS interface (developed by the Association of German Dental Software Enterprises) is used in the dental industry. WHEN IS IT WORTHWHILE TO PROCURE AN INTRAORAL SCANNER? It is advisable to procure an intraoral scanner if you mainly intend to implement digital planning in your treatment. WHICH INTRAORAL SCANNERS ARE SUITABLE? All scanners that generate STL data and file formats, whereby the relevant file size of the scans does not exceed 20 MB per jaw, are suitable. IN WHAT WAY DO THE VARIOUS INTRAORAL SCANNERS DIFFER FROM EACH OTHER? The various intraoral scanners differ in terms of technical and visual aspects. However, there are only minor differences in details. Specific differences should, therefore, be requested from the manufacturer. WHEN IS IT MEANINGFUL TO USE A MODEL SCANNER? The implementation of model scanners is meaningful if you intend to archive the plaster models and find that the time is not yet right for purchasing an intraoral scanner. WHICH MODEL SCANNERS ARE SUITABLE? All scanners that generate STL data and file formats, scan models in occlusion, whereby the relevant file size of the scans does not exceed 20 MB per jaw, are suitable. IN WHAT WAY DO THE VARIOUS MODEL SCANNERS DIFFER FROM EACH OTHER? Various techniques are used, for instance structured light scanning and laser scanning. Laser scanning is more accurate. It, however, needs considerably more time for digitizing plaster models. WHICH DATA AND FILE FORMATS CAN BE PROCESSED? There is no specific value for this. The file size should not exceed 20 MB per jaw. A file size of 5-10 MB per jaw is recommended. WHICH INTERFACES DO WE HAVE BETWEEN SCANNERS AND SOFTWARE OR THE TREATMENT MANAGER? The software provides an interface for the following systems: OrthoX, Smart Optics, Zirkon Zahn, True Definition, CS_3500, CS.Ultra and Dental Direkt. WHAT 3D PRINTING TECHNIQUES ARE AVAILABLE AND WHICH ONES ARE SUITABLE FOR ORTHODONTIC TREATMENT? 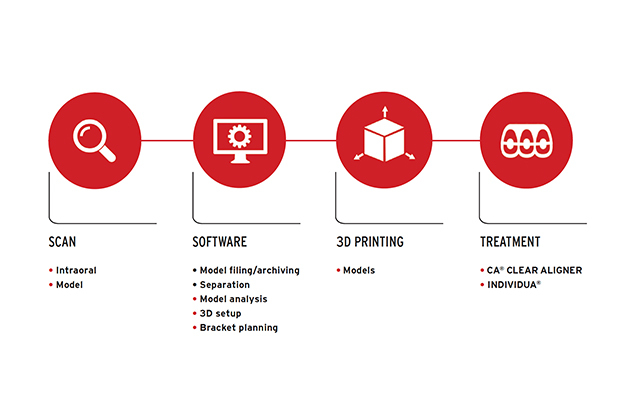 There are a wide range of processes for 3D printing. The most common methods used in orthodontics are stereolithography (STL) and 3D powder printing (3dp) whereby stereolithography offers the best cost-benefit ratio. WHICH 3D PRINTERS ARE SUITABLE FOR IN-HOUSE LABS? For instance, the Imprimo from SCHEU-DENTAL. WHAT ARE THE ADVANTAGES OF A NETWORKED PRODUCTION PROCESS? All information can be accessed and edited from any workstation. WHAT ARE THE ADVANTAGES OF AN ONLINE TREATMENT MANAGER? The online treatment manager offers an overview of all patient data and the relevant progress status. WHAT ARE THE PREREQUISITES? WHICH TRAINING PROGRAMMES ARE REQUIRED? HOW DIFFICULT IS IT TO INTRODUCE DIGITAL PROCESSES IN PRACTICE? It is not difficult if your staff is willing to work with digital media. Having a good technical infrastructure is a prerequisite. It is very easy and straightforward with CA DIGITAL. We will be pleased to advise you about all aspects.